Christkindelmarkt is back in town - bratwurst anyone? The continental flavours of Christmas will once again be wafting across Millennium Square with the return of Christkindelmarkt. The German Christmas Market returns to Leeds from Friday 12 November 2010 bringing a unique Teutonic festive atmosphere to the heart of the city. Over 40 German traders operate in a mini-village of traditional wooden chalet stalls. Christkindelmarkt is now one of the biggest traditional Christmas markets in the UK. Over a quarter of a million visitors are expected to patronise the market in the lead up to Christmas. The traditional German delicacies on offer include gluhwein, bratwurst sausages, snitzels, soups and goulash, stollen, gingerbread, roasted nuts and candied fruits amongst many others. As well as food and drink, the Christkindelmarkt offers a little something for those looking for gift ideas with toys, jewellery, Christmas cards and unique festive decorations on offer. The centrepiece of the market is the Frankfurter-Scheune - an authentic Bierkeller serving up real German beer, a specialist food menu and regular musical entertainment with an authentic German show band. Aside from the market there is also a selection of family funfair rides from the traditional carousel to dodgems. 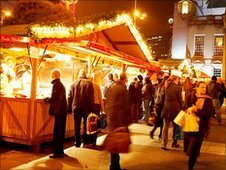 Now in its ninth year, Christkindelmarkt is organised by Leeds City Council in conjunction with their counterparts from Frankfurt City Council. Christkindelmarkt is open daily from Friday 12 November until Sunday 19 December 2010. The market and funfair opens daily from 10.30am to 9pm Monday to Saturday and 10.30am to 8pm on Sundays. The 'Frankfurter Scheune' bierkeller and selected stalls open late until 11pm. **Due to arrangements for Remembrance Sunday on 14 November the market will not open until 12pm.